Louis Levy - Combining elements of the serial film, detective story and gothic horror novel, Kzradock is a surreal foray into psychoanalytic mysticism. 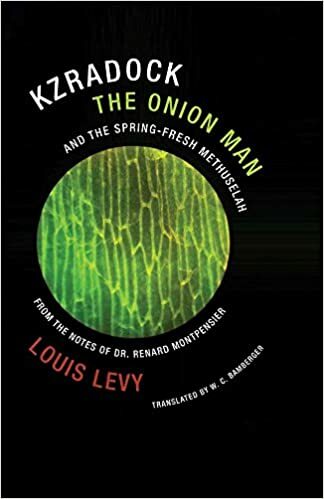 Louis Levy, Kzradock the Onion Man and the Spring-Fresh Methuselah: From the Notes of Dr. Renard de Montpensier, Wakefield Press, 2017. Originally published in Danish in 1910, Kzradock the Onion Man and the Spring-Fresh Methuselah is a fevered pulp novel that reads like nothing else of its time: an anomaly within the tradition of the Danish novel, and one that makes for a startlingly modern read to this day. Combining elements of the serial film, detective story and gothic horror novel, Kzradock is a surreal foray into psychoanalytic mysticism. Opening in a Parisian insane asylum where Dr. Renard de Montpensier is conducting hypnotic séances with the titular Onion Man, the novel escalates quickly with the introduction of battling detectives, murders and a puma in a hallucinating movie theater before shifting to the chalk cliffs of Brighton. It is there that the narrator must confront a ghost child, a scalped detective, a skeleton, a deaf-mute dog and a manipulative tapeworm in order to properly confront his own sanity and learn the spiritual lesson of the human onion. What will be related here is a dreadful and bloody mystery, one that is still not entirely understood by the author. Kzradock is a patient of the doctor's, though the opening scene certainly isn't one of any traditional psychiatric treatment session: it's of a séance. Whatever is buried in Kzradock's soul -- and the doctor warns that's a lot: "When I began treating him he was on the verge of collapsing under the weight of the burden that he carried in his unconscious" -- apparently can only be reached by both mystical and medical treatment. There is murder, of two women, Alice and Yvonne, vividly described ("the carpet is so red that you can hardly tell what is blood and what is carpet"), and with murder and police investigation, Kzradock employs traditional (early-days) detective story devices, twists and all. Yet despite involving the Paris police -- a Monsieur Carbonel -- and an American detective, Mister Wells, the real mystery is on the personal level: Kzradock is a literally soul-searching novel, and it's simplest summing-up would say it is the story of an identity crisis. There's a reason the doctor refers to Kzradock as 'the Onion Man', and there are a lot of layers to peel back here. "No fire," replied the fire chief. "But there is a revolution." Now I understood just what the struggle with Kzradock meant ! It was the struggle between madness and reason. A struggle between his insanity, which wanted to crowd into my circles, and my reason, which felt a curious desire to enter his world. And it doesn't come as too much of a surprise that that is very much an internal struggle. Is reason only disciplined insanity, an insane hallucination that has taken on form, and under whose influence we all live ? Is reason a dream created by chance, made useable by necessity ? The doctor goes through quite some ordeals -- all the way to the cliffs of Brighton. In conclusion, he can't be sure -- "Who knows whether I have truly escaped ..." -- but he's found some of the answers for himself. They include the lesson learned: "You have to doubt your own soul". This too is very much of its time, a worldview informed by the theories (or fads ...) of the day -- but it's nicely mixed up and in by Levy, the doctor's travails and adventures using all of this well in reaching his conclusions. And if it's all a bit overheated -- the action as well as the ideas -- it's certainly quite good fun, especially in its bizarreness. But the atmosphere and action Levy conjures up are enough to give the reader some sense of this abyss he explores.